Grab your hat and read with the Cat in the Hat! On Monday, March 3, it’s Read Across America Day with the National Education Association, so we can all celebrate our love for books and reading! As parents and teachers, we can set a good example as a reader. Let children see us reading every day, whether it’s a book, magazine, or newspaper. In addition to taking kids to the library and bookstore, we can also give kids a subscription to a magazine – my 7-year old son loves receiving the free LEGO Club Jr. Magazine in the mail, and excited to read the comics and do the puzzles. If you’re looking for book inspiration, check out a booklist that highlights books about each of the 50 states, as well as an Asian American booklist. My son enjoyed reading “Kimo’s Surfing Lesson” by Kerry Germain, where Kimo teaches his cousin Katie how to surf; and “Lin Yi’s Lantern” by Brenda Williams, where Lin Yi goes to the market to buy food for the Moon Festival. For teachers, Seussville.com offers an updated “Hats Off to Reading” Classroom Activity Guide, with suggested books and activities, a birthday card, and a reading certificate. 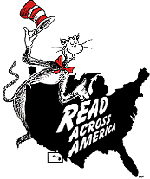 Reading Rockets has more Read Across America resources. 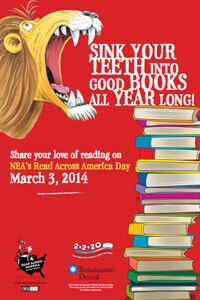 Read Across America is sponsored by Renaissance Dental, which is promoting good oral health with National Children’s Dental Health Month in March. Help kids practice good dental habits with an oral activity book, a brushing and reading log, and activity sheets. Later this week, on March 6, the United Kingdom is celebrating World Book Day. It’s a day to encourage children to read books by giving them a book of their own. Children are given £1 Book Tokens, which they can use at participating booksellers for free books. They have also put together a list of 20 failsafe activities, like holding a book swap, performing a story, inviting a local author, and having a book character parade. What are you reading now? Where will a book take you today?